The beauty and grandeur of Chinese bronzes are equaled only by their historical fascination. Group of 14 bronzes from the collection of Daniel Shapiro, being offered by J.J. Lally & Co. of New York. “Min” fanglei, late Shang or early Western Zhou period (11th century B.C.). Ritual bronze food vessel ding, Eastern Zhou dynasty, late Spring and Autumn period, circa 6th–5th centuries B.C. 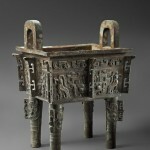 Among the most mysterious, intriguing, and austerely beautiful of Chinese artworks are archaic ritual bronzes. For the most part they are vessels for food or drink, in various forms, rounded with handles or sharp-edged and box-like, resting on tripods or directly on their bases, with or without handles, and covered all over with intricate abstract designs and semi-abstract depictions of real and mythical animals. The millennia since they were cast have left them with encrustations of patina, mainly in shades of green but sometimes heightened with other hues, that add to their visual and tactile impact. They have been prized and collected as antiquities in China since at least the 12th century A.D., though most known examples were excavated relatively recently, during the 19th and 20th centuries, usually by peasants who dug them out of the ground more or less by chance but later by archaeologists both Chinese and Western (of course those in the latter category are not available on the art market). For a long time, Chinese collectors shunned ritual bronzes because of an ingrained aversion to owning objects that came out of tombs, leaving the field to Europeans and American. More recently, that taboo has relaxed, and archaic Chinese bronzes are aggressively collected in the East and West alike. The oldest and arguably best examples of bronzes come from the Shang Dynasty (circa 1600–1050 B.C. ), the earliest one of which we have an archaeological record. While the semi-mythical Xia Dynasty (circa 1700–1500 B.C.) 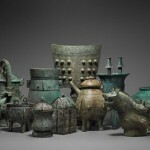 can be said to have inaugurated the Chinese Bronze Age, under the Shang bronze became the primary art medium, and the combined flowering of technology and creativity yielded a trove of bronzes that is the most highly prized by collectors in the past and today. 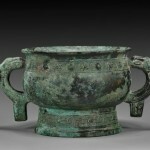 Basically, Shang bronzes were used to hold alcoholic beverages and food that were offered to deified ancestors as expressions of reverence, and as such were elaborate, vastly more ornate versions of vessel forms that were used for food and drink in ordinary life. In the rituals—details of which are scanty due to lack of documentation, a problem that affects much of our knowledge of archaic Chinese material culture—Chinese elites took part in communal banquets, a sort of multi-generational family meal that included the dead as well as the living. And after the owner of a bronze vessel person died, it would be buried with him in his tomb, thus the appellation “grave goods” for these as well as many other objects that met the same fate. Many vessel forms are attested, and scholars, dealers and collectors refer to them by their Chinese names. The most keenly sought after are sacrificial and wine vessels. A ding is a rounded, wide pot-like vessel mounted on a tripod, with two handles, one on each side. 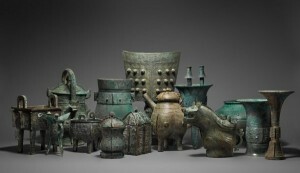 A gu is a tall wine cup with no handles or legs, while a yi is a box-like structure with a lid that looks like the roof of a building (many bronzes have a quasi-architectural quality). A zun is a type of wine cup that originally resembled a gu but later assumed a variety of animal shapes. Among food vessels, a dui is a tripod-mounted hemispherical dish with a hemispherical cover, the whole thing taking the form of a sphere when closed. A you is a covered pot with one handle attached on both sides of the vessel’s mouth, while a yu is a water basin with several small handles. Other categories of archaic bronzes that are not vessels are drums and cymbals (gu and bo), bells (zhong), and weapons and military accouterments such as the dui, a decoration for a spear-handle, often in animal form, jian, a rare type of sword, and zu, an arrowhead. 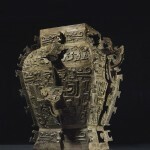 Archaic Chinese bronzes were made using the so-called piece-mold technique, in which a clay mold of the desired object, taken from a model, is cut into pieces that are then fired and filled with molten bronze (an alloy of tin and copper). The resulting bronze pieces are then fused together to make the finished product. Though this technique is unusually time-consuming (other Bronze Age cultures used the easier lost-wax method), it allowed for very intricate and precise relief work on the surface, since the patterns could be cut or stamped into the inside of the clay mold elements. The patterned surfaces consist of very complex interlacing designs that do not resemble much else in Chinese art—if anything, they remind one of certain characteristic elements of Mesoamerican art. The central motif is a sort of stylized animal face or mask called a taotie. There are many variations of it, some more abstract and hard to recognize than others, and it does not represent any particular beast occurring in nature. Sometimes it is more than just the mask, containing suggestions of legs and a tail. The mythic meaning, if any, of the taotie remains obscure. Any given vessel may have seemingly countless taoties peering out at the viewer from every angle. Another element of vessel decoration is called leiwen, a representation of clouds in the sky that looks somewhat like a Greek scroll-and-key motif. While all archaic bronzes, of course, are very rare, they do have the advantage of durability, and there are enough in circulation to make for a vigorous market. This month, as part of Asia Week New York, dealer J.J. Lally & Company is presenting an impressive single-owner collection of 14 archaic bronzes, put together over the past 30 years by a New York lawyer, Daniel Shapiro. Among the highlights is a Shang Dynasty gong (boat-shaped pouring vessel), circa 1200 B.C., with the cover in the shape of a tiger’s head with bared fangs and the back surmounted with an owl’s head. The bodies of the tiger and the owl blend together, surrounded by a cloud scroll pattern and little dragons and birds all over the vessel’s surface. Another Shang piece is a fangyi or box-shaped wine vessel with a roof-shaped cover, circa 1200 B.C., decorated all over with taotie masks. The Shapiro Collection also boasts a very uncommon musical bell or nao from the 10th–11th century B.C., which has no clapper and is sounded by hitting it with a wooden mallet. Covered with cloud-scroll motifs, it was most likely intended to be played at ritual sacrifices or banquets, or possibly to rally troops during military actions. Also during Asia Week, Christie’s Chinese art auction on March 20 will offer a very impressive archaic bronze, a fanglei from the late Shang or early Western Zhou period (11th century B.C.) 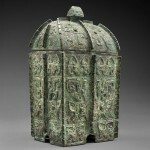 When it was last auctioned at Christie’s in March 2001, it set the world record for a Chinese bronze, at $9.2 million. 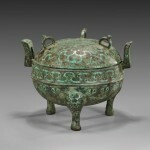 The history of collecting Chinese bronzes is a fascinating subject in itself. Chinese culture has long been particularly focused on its own past, and organized study of ancient objects began in earnest during the Song Dynasty (960–1279). Scholars of that period compiled lengthy catalogues with descriptions and illustrations of bronzes, jades, and other archaic objects. The most famous of these is the Kaogu tu, or Illustrated Study of Ancient Things, written by Lu Daolin in 1092. In 10 volumes, it documented 211 bronzes from the Imperial collection and other notable private holdings. Another important book, the Bogotulu, published in 1123, catalogued the Song court’s antiquities, including bronzes, many of which were later lost. These Song-era catalogues continued to be used by Chinese collectors and dealers right down to the modern period. In the century and a half since, knowledge of archaic bronzes has vastly increased, driven mainly by archaeological discoveries beginning with the excavation of the Shang capital city site at Anyang, in Henan province in central China. Back in the 12th century, the Emperor Huizong, a major collector of bronzes, had test pits sunk into the ground at the site but did not find anything. In 1928, bona fide excavation using modern archaeological methods was begun at Anyang, and in 1936, inscribed artifacts were discovered that proved once and for all that the Shang Dynasty was historic, not legendary. Digging continued in the city complex, and in 1976, an intact tomb was found that contained 468 bronze objects, including 200 ritual vessels. The making of ritual bronzes did not stop with the fall of the Shang Dynasty, by any means. Under their successors, the Western Zhou (1050–771 B.C. ), styles and techniques shifted somewhat while remaining essentially consistent with the Shang culture, which the Zhou admired and emulated. Relief became higher and animal forms for vessels became more common. New iconography such as dragons, birds and humanoid forms began to prevail over the time-honored taotie. During the Eastern Zhou period (770–221 B.C. ), incised designs with gold and silver inlays, formerly used only on ceremonial sword blades, were introduced on bronzes. This style is especially characteristic of the Warring States period (475–221 B.C. ), and it was copied extensively during the much later Song and Ming Dynasties, when homages to ancient artworks (not the same as fakes in modern terms) were popular. Song and Ming imitations are collected today and are particularly desirable if they can be conclusively dated, according to Izzy Chait of I.M. Chait Gallery/Auctioneers in Beverly Hills, Calif. “Shang and Zhou bronzes have skyrocketed in value over the past five to eight years, especially the past two to three,” says Chait. “We had inklings about 15 years ago when a few started bringing incredible prices. High quality has been driving the market, and it’s also driving the market for modern and older imitations.” Modern fakes, created by the legendary ingenuity of China’s craftspeople, are definitely something for the collector to be wary of, but “most of the time they are of very bad quality and very easy to see,” says Paris-based dealer Christian Deydier, a specialist in archaic bronzes. “As jade, paintings, and porcelain are now very expensive,” says Deydier, “a lot of top collectors are discovering that bronzes are still extremely cheap.” Of course, cheap is a relative term, but certainly the vast majority of bronzes are nowhere near as pricey as Christie’s $9.2 million fanglei. Second- and third-tier price pieces can be had in the five figures—Shang or early Western Zhou beakers or wine cups can bring $30,000 for ordinary examples to $100,000 or more for elaborate ones. Warring States bronzes that are plain and unincised can be available for as little as $10,000–20,000. “For the Warring States period, the prices are reasonable, and only those in rare and exceptional shape can be extremely high,” says Deydier.